Sciadiodaphne Rchb. Syn. Red. 118. (1841) nom. rej. Nuttall, T. 1842. The North American Sylva 1(2): 87.
International Plant Names Index. 2016. Umbellularia. Published online. Accessed Oct. 5 2016. Tropicos.org 2016. Umbellularia . Missouri Botanical Garden. Published on the internet. Accessed: 2016 Oct. 5. 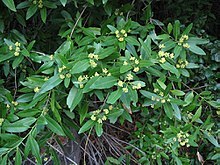 For more multimedia, look at Umbellularia on Wikimedia Commons. This page was last edited on 12 January 2019, at 05:14.